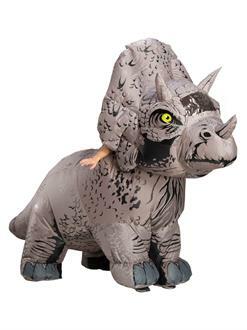 Unleash the gentle beast within with the Jurassic World: Fallen Kingdom Men?s Triceratops Inflatable Costume. Whether you?re gearing up for a Halloween bash or hitting up the next convention, this inflatable jumpsuit with (2) battery operated fans will make a splash. Shop officially licensed Jurassic World costumes online now.